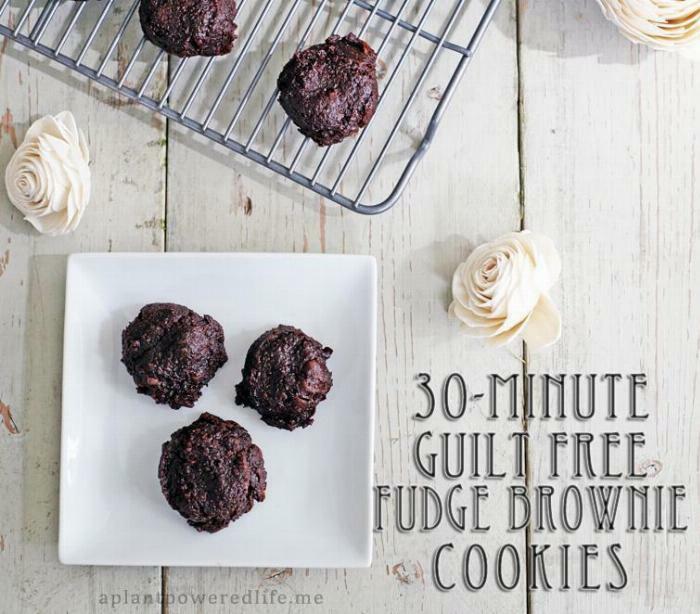 Guilt-Free Peanut Butter Fudge Brownies that can be made in 30 minutes or less! And they are vegan, gluten free, soy free, and refined sugar free! 1Preheat oven to 350F. Line a baking sheet with parchment paper or very lightly grease. 2In a food processor, shred a 2-3 inch chunk of zucchini to form 1/2 cup of shredded zucchini. Set aside in a small bowl. 3Change the blade of the food processor and add walnuts. Process on high for 1-2 minutes until a small crumble forms. Add to the small bowl with the zucchini. 4Add pitted dates to the food processor and process until a smooth paste forms. 5Add the zucchini and walnut mixture back to the food processor with the dates. 6Add remaining ingredients except for chocolate chips and process until smooth. 7Remove blade from the food processor bowl and stir in chocolate chips. 8Using a cookie scoop or large spoon, drop balls of dough onto the cookie sheet. Gently press down to slightly flatten. 9Bake for 15 minutes. When done, let cool on a cooling rack. Store extras in an airtight container.